A team of researchers with members from the U.K., Switzerland and Spain has found that chimpanzees use communication gestures in ways that follow human linguistic rules. 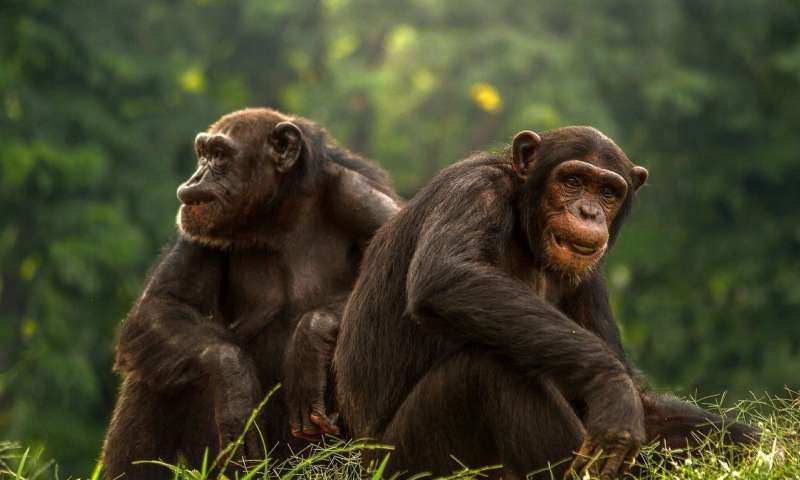 In their paper published in Proceedings of the Royal Society B, the group describes their study of chimps communicating with one another in the wild, and compares their observations against human communication rules. Over the years, linguistic researchers have discovered that human language conforms to specific rules regardless of the language in which it is spoken. Such rules have names to make them more easily discussed. One such rule, Zipf's law of abbreviation, holds that words that are used frequently tend to be short. Another rule is called Menzerath's law—it says that large language structures tend to be made up of multiple short segments (syllables) when spoken. In this new effort, the researchers wondered if such rules might apply to other animals. To find out, they obtained and studied video footage of wild chimpanzees living and communicating in Uganda's Budongo Forest Reserve. The researchers were able to identify approximately 2,000 examples of 58 unique gestures used by the chimps when communicating with one another. Since chimps cannot speak, they communicate by using hand gestures, body posture, facial expressions and they make various noises. By combining gestures that are available to them, chimps are able to convey a wide variety of messages to one another. The researchers found that human language rules do apply to the chimpanzees' use of gestures—the most commonly used gestures tended to be quite short, for example, and longer gestures tended to be broken up by multiple shorter gestures. They suggest that this indicates that despite the major differences in the mode of communication, the underpinnings of the two communications systems follow the same basic mathematical principles. Interestingly, an international team of researchers found just last year that human toddlers and chimps have very similar communications systems. The researchers plan to continue their research by expanding their analysis to include other species—they expect to focus on bonobos next because they are known to use many of the same gestures as chimpanzees.